- · All in one fully Automatic for perfect PET Winding Machine. - · Double servo motor controls winder displacement width and distance, winder displacement can be on the automatic according to strap’s specifications. - Inverter closed loop controls winding speed. - Instant heating in only 20 seconds. 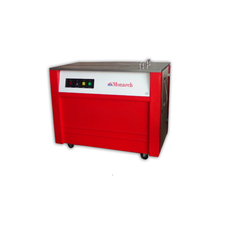 - Magnetic drive for faster speed packing. Our organization is well known in the industry for catering a distinguished segment of Box Straping Plant. Our company has gained name and fame in presenting Fully Automatic Box Strapping Machine.